For more on climate displacement, CGTN’s Rachelle Akuffo spoke to Alex Randall, program manager at the climate change and migration coalition. 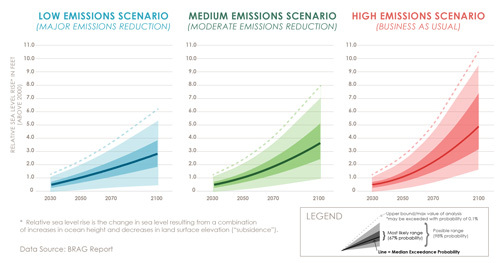 A chart from the Climate Ready Boston report showing projected sea level rise for three different emissions scenarios. More severe storms, higher coastal waters, and extreme heat waves are coming to Boston in the near future. Mayor Marty Walsh’s administration plans to prepare the city for climate change using scientific projections compiled by a team of scientists from across the region. This group, led by School for the Environment Associate Professor of Hydrology Ellen Douglas and Professor of Climate Adaptation Paul Kirshen brought together experts to focus on sea level rise, coastal storms, extreme precipitation and extreme temperature projections for the Boston region. By 2050, sea level rise in Boston will likely be between 8 and 18 inches. The worst case scenario could mean 30 inches of sea level rise by 2050. By 2100, sea level rise will likely be between 2.5 and 7.4 feet. The worst case projection suggests that number could be as high as 10 feet. The fourth edition of this highly regarded and successful text continues to provide a clear and accessible introduction to the world of GIS for students and professionals. With an increased focus on the practical applications of GIS, the new edition features a wealth of new multi-disciplinary case studies and examples of GIS in practice, demonstrating how it is used worldwide and within a variety of different industries. Furthermore, the new edition has been substantially revised and updated to include coverage of the latest advances in GIS such as web and mobile applications. An Introduction to Geographical Information Systems is suitable for students of Geographical Information studies at all levels, from undergraduate to professionals retraining in GIS.